Kaboom! Watching and listening to a thunderstorm can be exciting, but you wouldn’t want to be out in it. All thunderstorms make lightning and lightning is dangerous. Lightning happens when ice and water particles bump around inside thunder clouds. As they bump into each other, they create an electric charge. When the charge connects with electrical charges on the ground, lightning strikes. Lightning happens when ice and water particles bump around inside thunder clouds. to create an electric charge. When the charge connects with electrical charges on the ground, lightning strikes. Lightning is most likely to hit tall objects, including trees, mountains and people – anything that stands up from the ground. 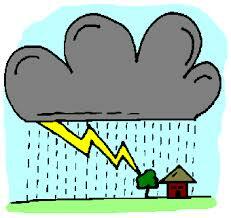 Thunderstorms can happen at any time of the year, but they happen most often during the spring, summer and fall. They also happen most often in the afternoon and evening. There are more than 1,800 thunderstorms every day on Earth. 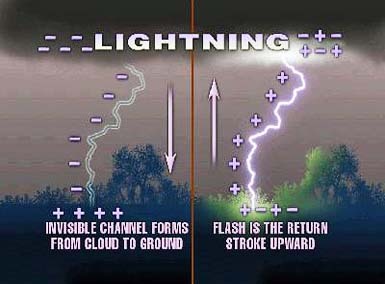 All About Thunder and Lightning: When lightning strikes it makes a hole in the air called a channel. After the lightning is gone, the hole collapses. The sound you hear when the hole collapses is thunder. 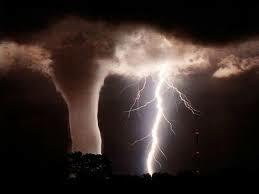 Lightning kills more people every year than tornadoes or hurricanes – about 75 to 100 people. When lightning strikes it makes a hole in the air called a channel. After the lightning is gone, the hole collapses. The sound you hear when the hole collapses is thunder. You can hear thunder up to 15 miles away. You can see lightning up to 100 miles away! Don’t go near trees or water in a thunderstorm. A video explaining why there is thunder and lightning. Question: Can you tell how far away a storm is? Answer: When you hear thunder, start counting until you see lightning. Now divide the number of seconds between the thunder and lightning by 5. That’s how many miles away the storm is. Say, for example, you counted 10 seconds between the thunder and lightning. 10 divided by 5 equals 2. The storm is two miles away. Question: What should you do in a thunderstorm? Answer: Get to shelter, such as a building or a car, quickly. If there is no shelter, get down on your hands and knees and tuck your head down. If your hair stands on end or you feel tingly, lightning is about to strike. Don’t go near trees or water in a thunderstorm. Enjoyed the Easy Science for Kids Website all about Thunder and Lightning info? Take the FREE & fun all about Thunder and Lightning quiz and download FREE Thunder and Lightning worksheet for kids. For lengthy info click here. Declan, Tobin. " Thunder and Lightning Facts for Kids ." Easy Science for Kids, Apr 2019. Web. 18 Apr 2019. 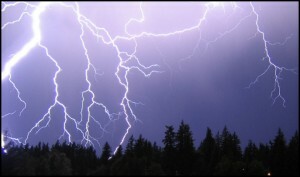 < https://easyscienceforkids.com/all-about-thunder-and-lightning/ >.